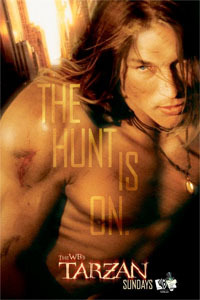 The complete TV drama series Tarzan, which aired on the WB in 2003, starring Travis Fimmel, Sarah Wayne Callies and Leighton Meester, now available in its entirety on DVD Box Set exclusively at DVDRare.com! Includes unaired pilot with another actress playing Jane's sister. The set includes all 8 episodes. Good audio and video quality, and no commercials! A NYPD detective, Jane Porter's ordinary life is disrupted when a routine case unexpectedly leads her to John Clayton, who prefers to be called Tarzan. After being proclaimed dead for 20 years, John Clayton was found in the jungles of Africa by his billionaire uncle, Richard Clayton, who is the CEO of powerful Greystoke Industries. Held against his will at his uncle's home, Tarzan escapes and prowls all over the city, helping others in need. Upon meeting Jane, he begins to follow her from her home to crime scenes, simultaneously assisting her with her police cases.